I visited the ground a few years ago after recent redevelopments and found the ground in need of improving. The away fans sit on plastic 'swing' seats on the old terrace and this gives the classic seats on terrace comfort. No leg room, no cover and no view. We have to stand for most of the game. The main stand is in need of new seating. Faded colours or previous logos make it look like its made from lego! Opposite the main stand is the new stand which adds some sense of achievement at Swindon even if the days of Glen Hoddle now seem a long way away. Good food and catering facilities for home fans in this new stand but away fans travel with your waterproofs and a flask. Exit the M4 at junction 15, and follow the A419 toward Swindon. Follow the A419, to the junction with the A4312, and then follow the A4312 towards the town centre. The flood-lights can be seen from here. Follow the A4312 to the 'Magic' roundabout. Here, you are going to have some fun!!! This is basically a large roundabout system, with mini roundabout around the perimeter. This actually work quite well, but its a bit of a free for all! You need to turn right, into County Road. The ground is on the right hand side. 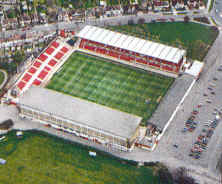 The nearest train station to the County ground is Swindon, which is about a 10 minute walk. To find the ground from here, exit the station into Station Road (...well that name took some thinking up!!!). From here, go straight over into Manchester Road, and follow this road through the town. At the T junction with the County Road, turn left, and the ground in on the left hand side. If you are a registered user then you can login, and create your own personal review of Swindon Town Football Club - The County Ground. These reviews can be private or public.